In a country infamous for being the second-biggest contributor of plastic waste to the oceans, a city in West Java has achieved a close to 100 per cent segregation rate. This is how Depok transformed its waste system. Waste is rapidly becoming one of the most pressing issues of all time. More than a decade after Bandung’s Leuwigajah dumpsite disaster in West Java in which 143 people died buried under a waste avalanche, there is still no strict law enforcement to divert waste from filling up landfills. Some laws such as the 2008 Waste Management Law, enacted more than nine years ago, have required Indonesian citizens to sort their waste to increase the 3R (recycle, reduce, reuse) system in each municipality. However, those laws have shown very limited results. Segregation rates among households in Indonesia remain persistently low according to Waste4Change, a local waste-management organisation. Worldwide, 8 million tons of plastic end up in oceans every year, 16 per cent of which comes from Indonesia as the second-biggest contributor. In 2016, the country alone generated 3.2 million tons of plastic waste, of which 1.29 million ended up in the oceans. Fortunately, Indonesia has pledged to put up $1 billion a year to reach a 70 per cent reduction in marine waste by 2025 at the World Oceans Summit in March 2017. The national government should look at some local communities in Depok that have successfully proven to be a model in diverting hundreds of tons of waste from going to landfills and leaking into the oceans. Indeed, the future is not all doom and gloom. 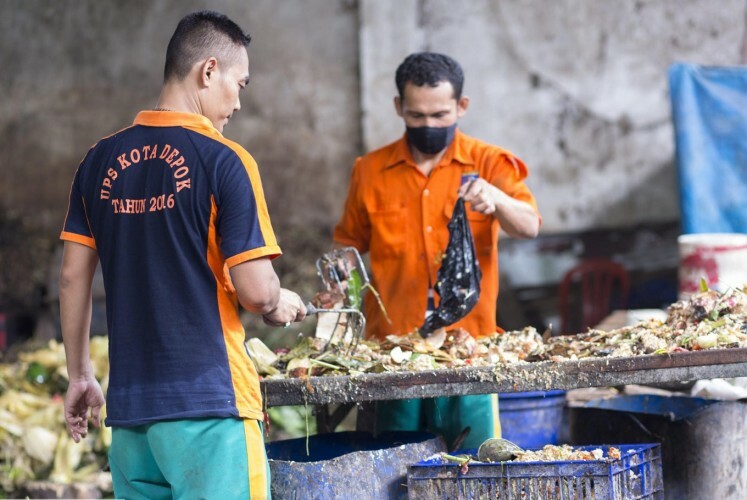 From almost nil to almost 100 per cent segregation rates, a pocket of about 100,000 households in the city of Depok in West Java have managed to divert almost 72 per cent of all their household food scraps and packaging from landfills. Back in 2012, the Jakarta governor launched a “Clean & Green” campaign targeting the capital city and its suburbs. In Depok, the city administration decided to concentrate its resources on waste segregation by creating a system called Partai Ember (Bucket Party), which included new regulations to encourage and enforce residents to separate their household waste into material streams of organic (i.e. food scraps), inorganic (i.e. recyclables) and residue. After a year of effort, community leaders could communicate results. The city managed to divert 148 tons of waste daily from landfills. Of which, approximately 99 tons comprised organic waste from households, 27 tons from the city’s organic and landscape material, and 22 tons of recyclables that have been going to waste banks. This is approximately 12 per cent of the total waste generated in Depok. More than 100,000 households have been segregating their waste, increasing recycling rates. Four hundred waste banks—waste collection and segregation points—were created for 2,000 community units (RW) in Indonesia. Once segregated, household waste is sent to huge waste banks called UPS where organic waste is transformed into compost and inorganic waste is sent to recycling factories. Managing director of Waste4Change, Bekasi-based local waste management organisation, M. B. Junerosano explains some of the key success factors of the Depok system. “The management has an integrated infrastructure and processing system, starting with sorting at the source: organic waste is required to be placed in the bucket, inorganic waste is sent to waste banks or for recycling processing, and residue to landfill. If there is no sorting, then the waste will not be transported and any illegal dumping will be prosecuted,” he said. A strict enforcement of the new system and regulations was also key. The administration refused to pick up the waste if residents failed to segregate it. They also had 25 waste police officers covering Depok to patrol for offenders. About 300 people were prosecuted for their inaction in segregating their waste. In order to succeed, Zamrowi and his team had to spend a lot of time on the ground. Going from door-to-door, casual and educational conversations appeared to be the most effective way to convince communities to segregate and to recycle. Hence the name “Bucket Party”, which refers to the casual meetings and the two buckets used to separate the waste. This social setting has been key to their success. Another step was to change the collection schedule in order to have a different vehicle and timing for each material type. Organic waste was collected every other day, recyclables had to be transported to waste banks, and the residue was picked up once a week. This was necessary to provide a clear and rigorous framework for communities not to be confused between organic and inorganic waste. The local Depok team was inspired by efforts overseas. Zamrowi heard about Depok’s sister-city partnership with Osaki in Japan and took the opportunity to learn how to drive segregation of waste within households. Since then, Depok has always looked up to Osaki as a role model. A collaboration between the two has been crucial for the Depok city officials in order to gain technical knowledge. Managing and recycling waste is a sign that we are civilised. It shows that we know how to take care of ourselves and our environment. “Before anything happened, officials were sceptical and unconvinced about the possibility of segregation on a large-scale. However, we have always felt that if other countries could do it, then so could Indonesians. If Depok starts the ball rolling, then other cities could follow and get inspired,” said Zamrowi. “The Bucket Party system in Depok shows evidence that an implemented and enforced solid waste management system is important in successful solid waste management,” added M. B. Junerosano. 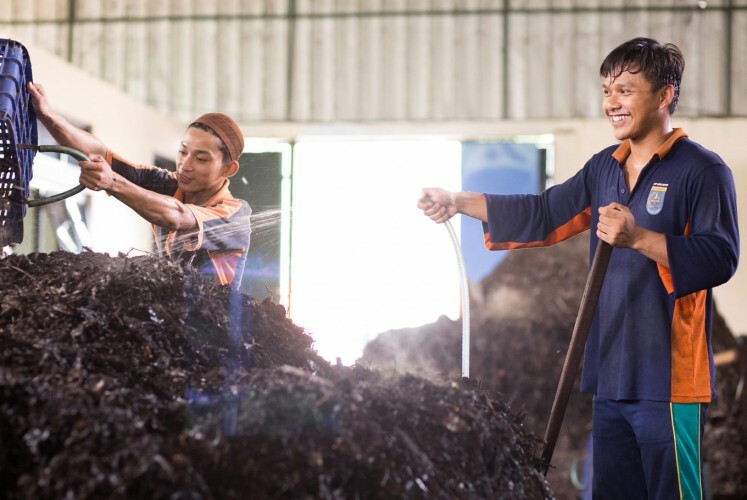 Today, Isnarto who has been collaborating with Zamrowi to make Depok a successful case study is proud to witness organic waste turning into compost. Ashwin Subramaniam is CEO and Founder of Gone Adventurin, and Paula Miquelis is Senior Project Manager at Gone Adventurin. This post was first republished in The Jakarta Post and was republished with permission.